SUPER SKETCH+ 시리즈는 SUPER C۞L۞R SUPER 가 기획하는 아티스트와 뮤지션의 만나는 비쥬얼 파티이다. 매 파티에서는 아티스트들과 밴드 그리고 관객이 프리즘으로 투사된 특별한 컨셉트와 주제로 하나의 접점에서 만나게 된다. 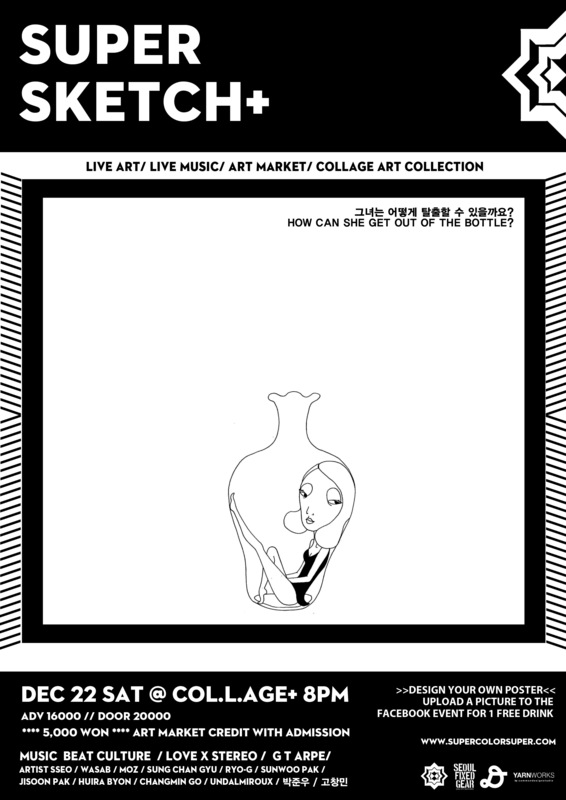 SUPER SKETCH+ 는 빈티지 프로젝터 위에 진행되는 라이브 드로잉, 아트, 그림자 극장 그리고 싸이키델릭 비주얼을 선사한다. 모든 작품들은 완전한 아날로그 방식으로 하나하나 손수 창조되며 보여진다. 아티스트와 디자이너들은 파티장 한켠에 마련된 아트 마켓에서 자신들의 제품들을 판매할 수도 있다. 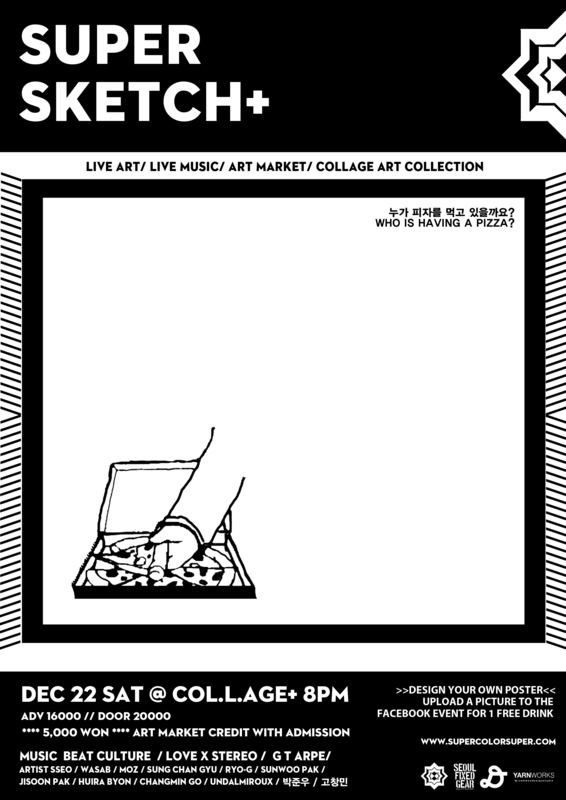 이번 SUPER SKETCH+ 는 청담동에 위치한 고감도의 유니크한 공간 Collage+에서 특별히 진행될 예정이며 라이브 아트의 주제또한 공간에 부합하는 Collage 로써 의미있는 콜라보레이션이 기대되는 2012년의 마지막 슈퍼스케치가 될 것이다. Collage+ 는 압구정 청담동에 새로 오픈한 대단히 감각적이고 독특한 공간으로써 겹겹으로 쌓인 인상적인 예술 작품들이 공간 전체를 둘러싸고 있다. 이 공간을 통해 많은 영감을 얻은 이번 SUPER SKETCH+는 기존의 파티보다 한층 더 색다른 경험을 선사할 것이다. The SUPER SKETCH+ series is a hookup between artists and musicians organized by SUPER C۞L۞R SUPER. Every event brings the artists, the bands, the audience and the party together through the prism of a special concept or theme. 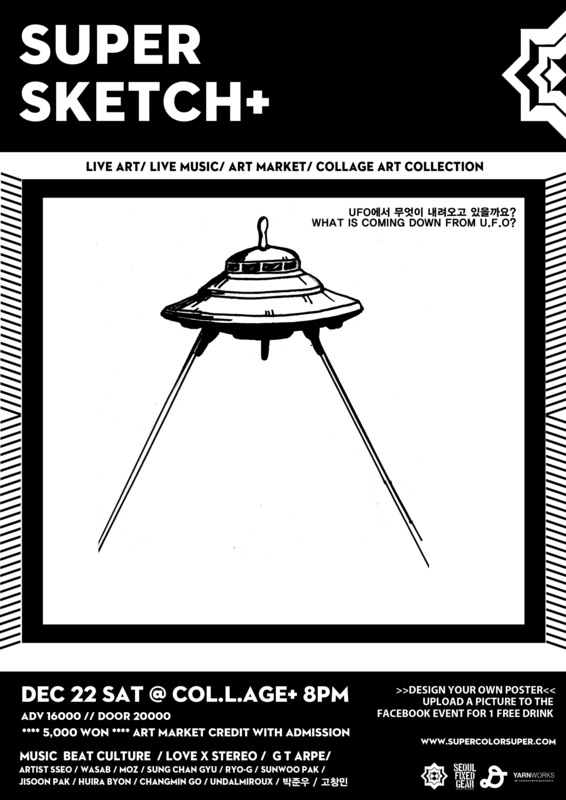 SUPER SKETCH+ features live drawing, art, shadow theater, and psychedelic visuals performed on vintage overhead projectors. All work will be performed and shown through completely-analog, hands-on means & methods. 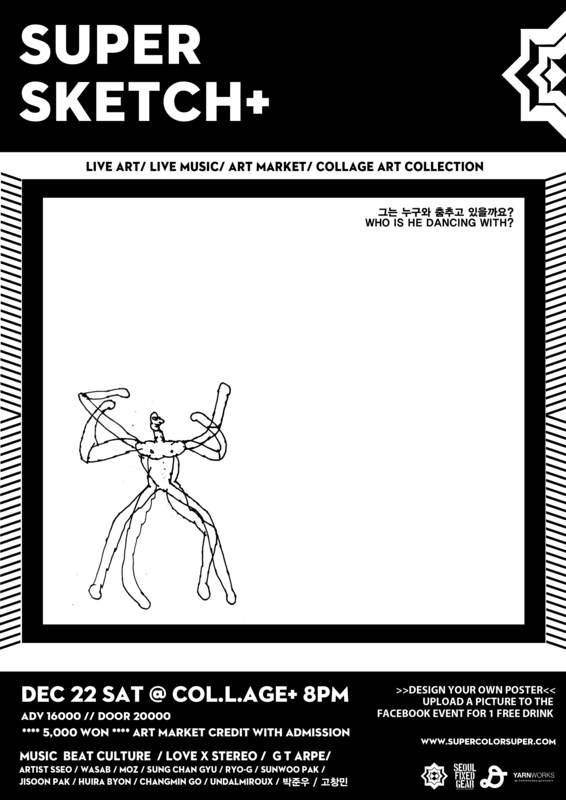 Artists and designers will also present their work in a special art market inside the party. 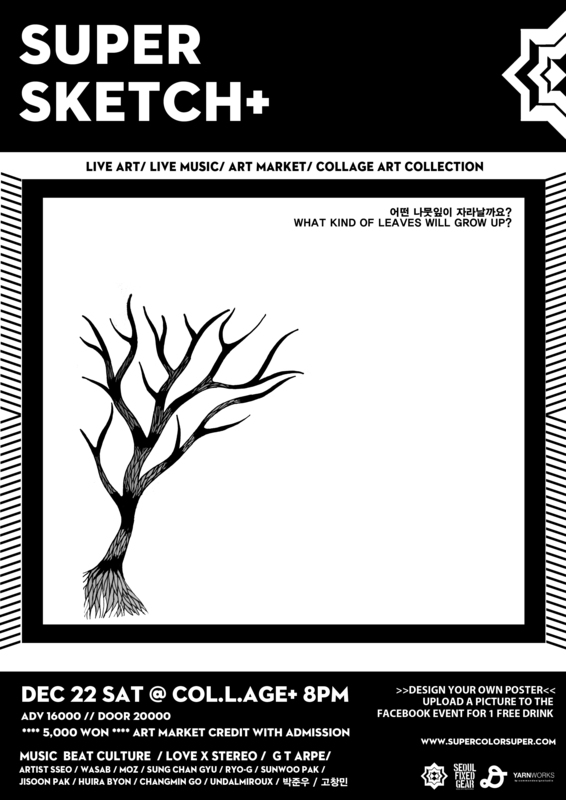 This SUPER SKETCH+ will be a special interaction, based on its very unique of Collage-themed collaboration to suit the venue. Collage+ is an extremely-unique, new venue in Cheongdahm, Apujeong with several layers of unique design, visuals and art. SUPER SKETCH+ will take on a unique form being inspired by this space. Make sure to include number of tickets and your mobile no. 참여하시는 모든 분들껜 무료 음료티켓을 드립니다. 그리고 멋진 포스터를 제작해주신 다섯명을 선정하여 공연티켓을 드립니다.